MPC's Premium Polyester Asset Labels consist of 2.0 mil gloss white polyester face stock, top laminated with a 1.0 mil clear polyester film. The 0.8 mil multi-purpose permanent pressure-sensitive adhesive provides high initial tack, and bonds to high- and low-surface energy plastics, lightly textured or contoured surfaces. 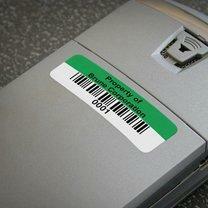 Why choose MPC’s Premium Polyester Asset Labels? High contrast for easy readability; color headers available. Clear laminate protects label against abrasion and chemicals. Multi-purpose adhesive permanently bonds to many surfaces. Good resistance to general purpose and household cleaners, mild acids, oil and water. Expected exterior life is up to two years. 2.0 mil gloss white polyester face stock; over-laminated with a 1.0 mil clear polyester film. 0.8 mil high-performance permanent pressure-sensitive adhesive. Black graphics on white background; color options available. Four standard sizes: 1.50" x .50" - 1.50" x .75" - 2.00" x .75" - 2.00" x 1.00". See price list for color options and part numbers. Custom sizes available. Shipped in sequential order, in rolls, in boxes. 100% no missing numbers. 10 working days from receipt of order and approval of artwork. Expedited shipment is available for an additional charge.